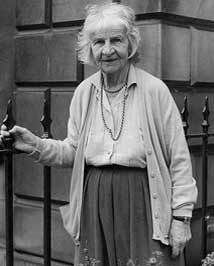 Naomi Mitchison's life spanned the 20th century. She wrote over twenty novels for adults, as well as children's books, short stories, social commentary, plays and autobiographical works. Born in Edinburgh, holidays in Auchterarder gave her childhood in Oxford a potent Scottish dimension. 'The Conquered' (1923) was the first of many acclaimed historical novels to flow from her pen. There followed vivid evocations of the ancient world such as 'The Corn King and the Spring Queen' (1931), 'The Bull Calves' (1947) and 'The Blood of the Martyrs' (1948). From 1937 she lived at Carradale on the Mull of Kintyre. A socialist, she committed endless energy to political debate about the future of Scotland, sat on various committees concerned with Highland affairs, and was a member of Argyll County Council from 1947 to 1964. She travelled extensively, and in 1963 the Bakgatla people of Botswana adopted her as a tribal adviser and 'Mmarona' ('Mother'). Her memoirs are contained in 'Small Talk' (1973), 'All Change Here' (1975), 'You May as Well Ask' (1979) and 'Among You Taking Notes 1939-45' (1985). Naomi Mitchison, outside the Scottish Arts Council, Edinburgh, 1980.